Loyola College provides many opportunities for staff and students to walk in the footsteps of Ignatius to give of themselves generously in the service of others. Christian service is core to developing the full human potential of our students – to strive to achieve their best and contribute their talents, skills and energy to building God’s kingdom in our world today. Our Young Vinnies meet weekly and plans a year-long program of fund-raising and advocacy events including Project Compassion, the Vinnies’ Easter, Winter and Christmas Appeals, Australia’s Biggest Morning Tea and the 40 Hour Famine. The College is also involved in advocacy campaigns such as the successful Jump Up for the Kids in Detention campaign which involved our whole school joining others around Australia in jumping together to raise awareness of the plight of refugee children and their families being held indefinitely in immigration detention. Every year Loyola participates in the Relay for Life to raise money for cancer research. The Winter Sleep- outs give many students a chance to experience what it would be like to be homeless. Similarly the Cage brings together students from the three Ignatian schools in Victoria to spend 24 hours sleeping rough without food or drink. The College also supports a range of other Charities including Catholic Mission and our sister school in Timor Leste. Every House at Loyola adopts a charity to which it directs its fundraising efforts through House activities and the annual Saint Ignatius Day walkathon. During Activities Week our entire Year 11 cohort volunteer for a week of Christian Service at a range of agencies that cover aged care, welfare, disabilities and the environment. Students are able to experience the many needs within our community and how agencies respond to them on a daily basis. Students continue their service for another 10 hours over the year, building on the relationship they develop with the agency they have been assigned or an alternative experience. 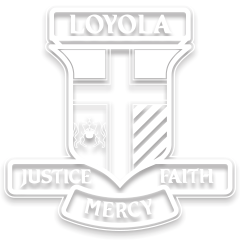 Loyola continues its weekly involvement in Refugee Tutoring, the Saint Pius X Reading Support and Concord programs. Each week a group of students heads out to assist with the literacy, numeracy and developmental needs of primary school students to help overcome the barriers to their learning. Over the holiday periods, students attend Sacred Heart Mission and the Ozanam Community Centre to assist with serving lunches to people doing it tough.